Yoga is a physical practice, a philosophy, a path, but also a form of Art. 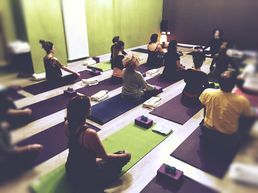 YogaArte is a centre established in 2010 by Michela Manuppella and Flaminia Tolomeo, in order - among other things - to promote and spread the knowledge of Yoga and reach a deeper self-consciousness, as well as to enhance Art, in all its forms, and develop creativity. YogaArte is a way to see life - and live it – as well as an outlook on beauty as an expression of your body, of language, of yourself. Indeed Yoga - just like Art – is a mixture of Rhythm, Harmony, Presence, Breath, Creativity. 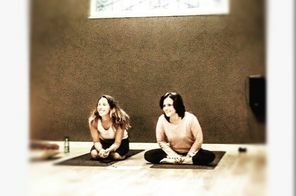 Moving Yoga, developed by the two founders of YogaArte, was born from the merger of different yoga styles, as well as from their shared passion for dance and rhythm. Through the 7 Rhythms of Moving Yoga, they propose a fluid, dynamic yoga, which develops your inner force, as well as muscle tone, and improves your posture and flexibility; they teach you how to move in tune with your own inner rhythm. They pay attention to the alignment of your body, as well as to suspension, expansion, and transition​.